Kaze no Tani no Naushika (1984) - Sci-fi-central.com.  Japan / USA  1984  117m   Directed by: Hayao Miyazaki.  Starring: Sumi Shimamoto, Mahito Tsujimura, Hisako Kyôda, Gorô Naya, Ichirô Nagai, Kôhei Miyauchi, Jôji Yanami, Minoru Yada, Rihoko Yoshida, Masako Sugaya, Takako Sasuga, Chika Sakamoto, Tarako.  Music by: Joe Hisaishi. In the far future, man has destroyed the Earth in the "Seven Days of Fire". Now, there are small pockets of humanity that survive. One pocket is the Valley of Wind where a princess named Nausicaä tries to understand, rather than destroy the Toxic Jungle. (Note: The old US release titled Warriors of the Wind is an entirely kiddiefied version which edits the original movie heavily, thus creating an entirely different story). 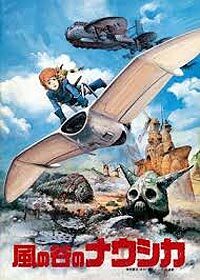 Before Princess Mononoke, which is still for me Hayao Miyazaki's greatest work, he made this film, Nausicaa of the Valley of the Wind, which like that other later film addressed issues that are paramount for the filmmaker: the environment, and the Earth, and how human beings can have highs and lows in attention to it. On the one hand Miyazaki gives us who is perhaps one of the purest heroes in any animated film, Japanese or otherwise, with Nausicaa as a woman who doesn't want killing on any side, and knows that there can be some peace with the environment of the world. Her greatest strengths end up coming out in various ways, like when she goes to stop the Ohm, the big beetle-insects that are the largest "threat" (threat in quotes because it depends on the reaction of the two sides- the Tolmekian and the Pejite- and how either one inflames the reaction of the Ohm)- and in her general attitude to killing and violence. It's a fragile world, and she's perhaps one of only a few, and the only one willing to 'go the distance', to understand how what remains underground, what can't be seen, can make a difference. She's like a big action hero for preservationists and pacifists, but it's such a strongly defined character that the basic qualities come out wonderfully, like when she has to contend with her obvious emotional reaction to her father being slain (almost a Star Wars 'force' moment if you ask me). So as she represents the good, there is the other side, which is represented by not necessarily the outright evil, even if the Tolmekian find the only way to combat anything is through warrior actions, but by ignorance and greed. It's not always as simple as that, and one could see a little dimension to the princess Kushuna, but even there the essentials get burned down to not just Miyazaki's points, but what works for the structure of classic fantasy. It might be tricky for Miyazaki to balance out his message of peace and understanding with what should be a sensational entertainment of a world 1000 years from now following an apocalypse; it treads the line, as Mononoke did, of becoming incoherent with the message and the manipulation of the audience. But Miyazaki happens to be intelligent enough to trust the audience on the front of the message, and so he puts up his film in his usual thrust of indelible, one-of-a-kind images and exciting action. I especially liked seeing the Ohm themselves, one by one looking like even more detailed, nuanced versions of the Garthem in the Dark Crystal. Or in the sky-flying scenes, where the clouds are like unique formations that can't really be of the world we're in, but are in this world nonetheless that Miyazaki forges from classic mythology, reinterpretations of forests and insects, and post-apocalyptic technology out of a high-powered junk-yard. And on top of this, as a word of note, this grandiose (in a good way) kind of epic work is supplanted with a better than expected voice cast- for the English language dub on the new DVD. They help back up the pieces of Miyazaki's world where there is some science fiction, but not in a fully compiled sense (if anything it's sort of like a 'used' science fiction world like Blade Runner, in part I mean). There's also some moments in the classical style, of a hero coming into her own that might seem too reminiscent of other movies. But Nausicaa is backed up by several cool supporting characters, like the equally heroic Lord Yuru, and the conflicted Pejite Asbel who has to choose the greater good (and common sense, in the Miyazaki form) over his tribe's priorities. By the end, it actually left me like Totoro did with a huge, well-earned smile on my face, due to it being one of those happy endings that is so unlikely, yet is done as if there could be no other way in Miyazaki's universe. It's fresh and sublime anime, and the master of Studio Ghibli at one of his best. Review by MisterWhiplash from the Internet Movie Database.